There were two things I remembered when leaving Izzy and Rob’s initial consultation. The first was how cute and cuddly Eze the sausage dog was. The second was the love that was clearly evident between Rob and Izzy. Izzy and Rob’s wedding ceremony at Horton Grange in Northumberland. Just look at Eze posing for the camera! I’m not talking about the extrovert, flashy sort of love and affection that has become a cliche. I mean the deep connection that comes from really understanding your partner and from truly listening to them. The love that comes from recognising tiny changes in expression and body language, not from showy gestures. The love of profound trust. Their wedding would be intimate and deeply felt. Meaningful in a way that, perhaps surprisingly, not all weddings are. I felt privileged to be invited into the day and I wanted to repay that trust by capturing the day photographically as authentically as possible. 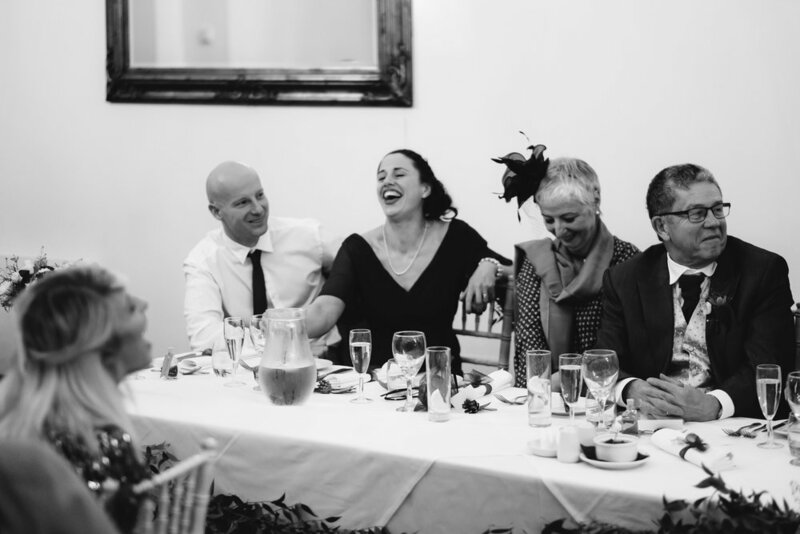 Like all good weddings, our photographic record of the day began on the pre-wedding shoot. We met up at Havannah Nature Reserve in Newcastle on a sun drenched autumn day. We got to know each other a little better, built up some trust, and had a good laugh. We had fun walking with Eze and got some lovely couples portraits. In no time at all the wedding day arrived in December. The wedding venue was new to me. Horton Grange is an elegant and intimate Grade II listed Country House set in 4 acres of beautiful grounds in Northumberland. The gardens were beautiful, with water features, lawns, flower beds and lots of hidden areas to explore. At night lamps and fairy lights lit up the gravel paths. 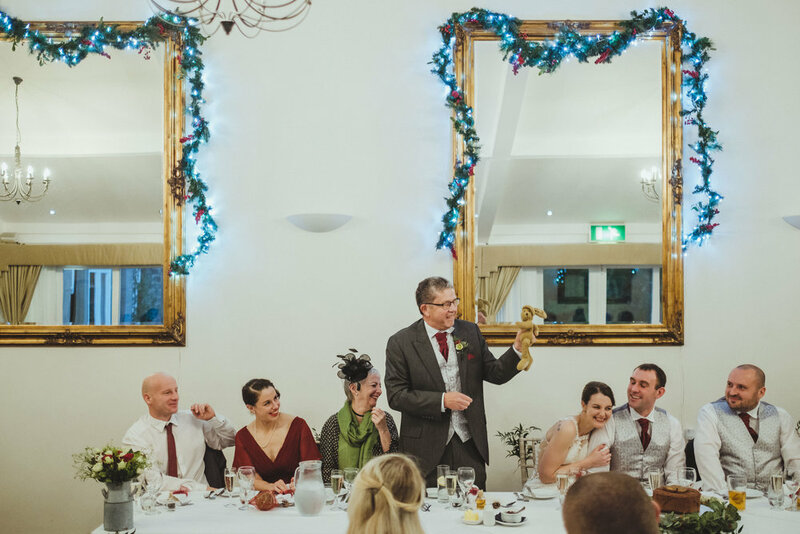 Sprinkle in some Christmas decorations and you have a magical wedding. Often, old venues such as Horton Grange can be dark and gloomy, especially in winter. Not so here. The ceremony room is very light and airy with windows lining the whole of two walls. A sea of pastel flowers completed the look. 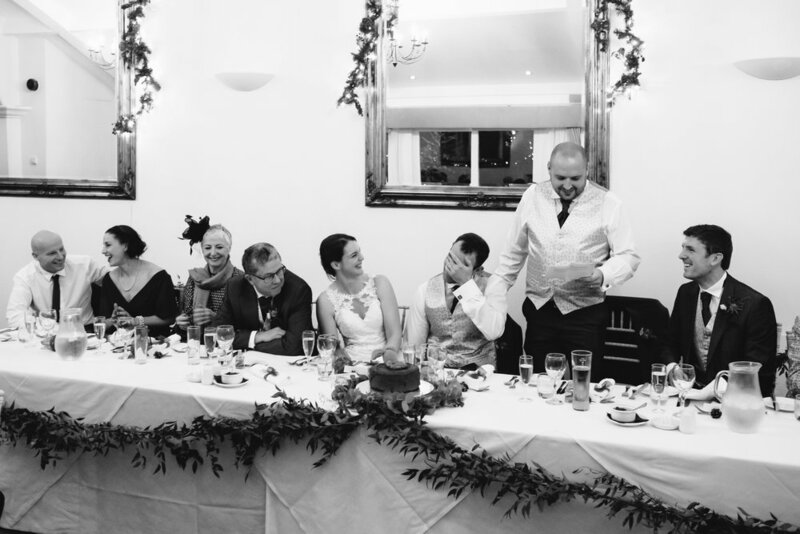 You can never guarantee the weather in the UK, and sure enough it was wet on the wedding day. So wet we couldn’t get outside at all. It didn’t dampen the spirits, though, and everyone thoroughly enjoyed the day. Especially Eze, the dog of honour. 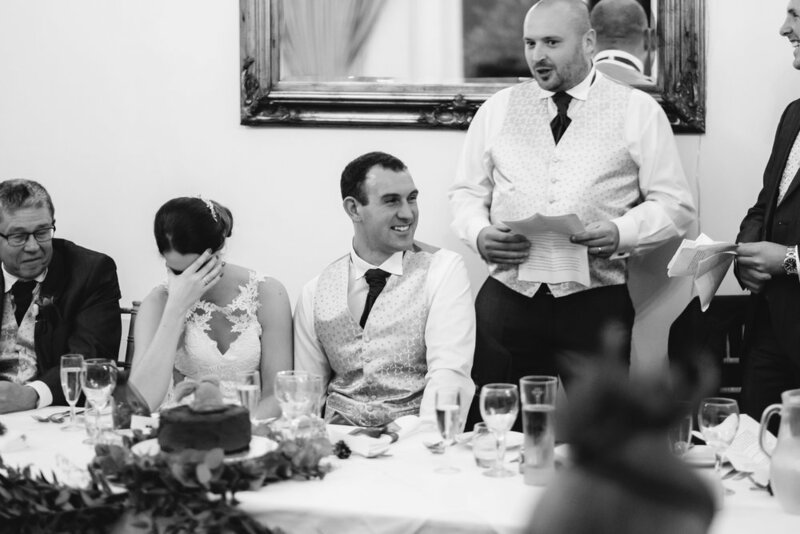 See if you can spot the moment she chose to ‘speak’ during the wedding ceremony! 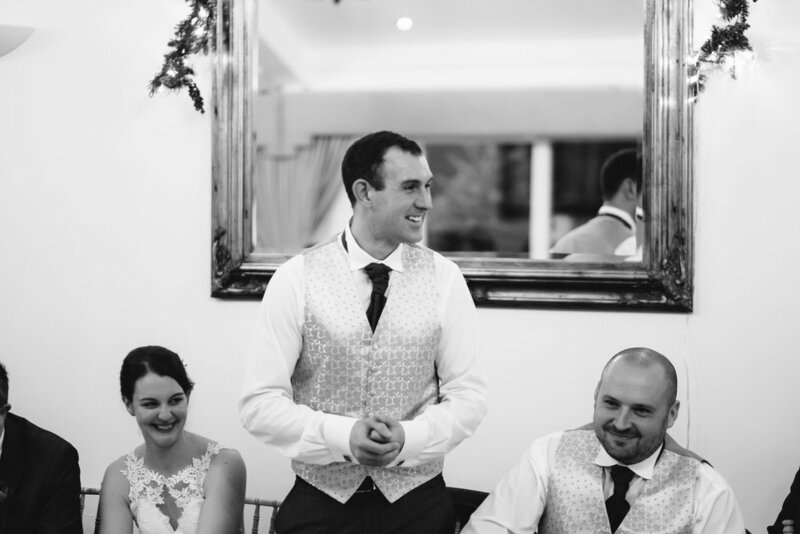 When it came to choosing a wedding photographer I knew what I didn’t want-cheesy pictures, lots of portrait style and rigid poses..I knew I wanted true, honest moments. Moments where I didn’t even know I was having a picture taken. Moments in the ceremony where the most intimate details were captured and moment’s during the speech where friends and families reactions were captured. Barry was our man. 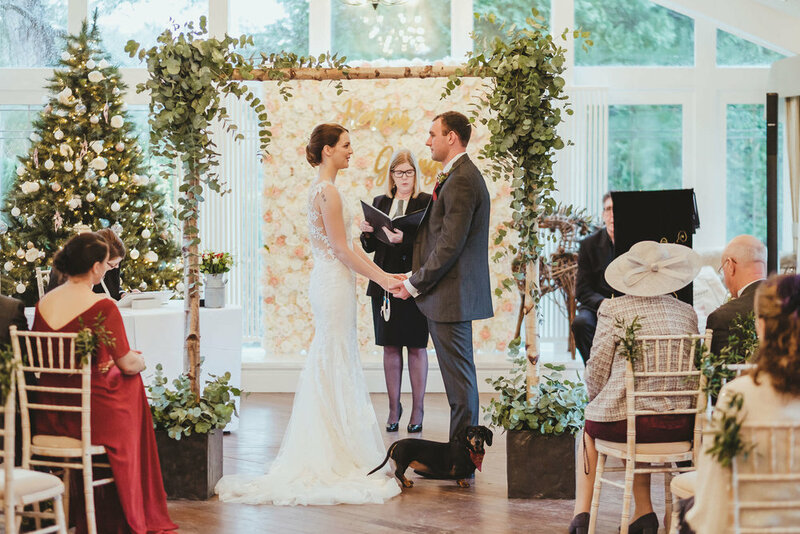 We had some formal type photos with the family but the rest of the pictures and my personal favourites include that first moment where I walk down the aisle, the ceremony, our sausage dog objecting to the whole thing! And the heads in hands and laughter at the speeches. Looking through these pictures is like re-living the day and this is indeed what one of our guests said. She said I felt like I was back hearing the speeches and feeling the atmosphere. If you want real, honest and unique pictures that represent you then this is the photographer for you. YOU CAN SEE MORE REAL NORTHUMBERLAND WEDDINGS, AND ENGAGEMENT SHOOTS, ON MY NORTHUMBERLAND WEDDINGS PAGE.